Glaucoma is an eye condition where there's damage to the optic nerve. Untreated, it can cause blindness. Several related disorders can cause this, and they're all different types of glaucoma. In our eyes, the light-sensitive layer at the back, called the retina, acts like a camera film or sensor in capturing what we see. The optic nerve then sends this image to our brain, which interprets it. Think of your eyes as being like a digital camera. You take a photograph (onto the retina), then connect the camera to a computer (your brain) with a cable (your optic nerve). You then download the image to the computer. Glaucoma causes progressive and irreversible damage to the optic nerve. It's like cutting the cable that connects the digital camera to the computer. Unfortunately, once it's damaged the optic nerve can't be repaired. Glaucoma is often detected during routine eye examinations. If it's caught early, it can be treated so you don't lose your sight. Glaucoma is caused by high eye pressure. A healthy eye must have some pressure within it. Without any pressure, it would collapse like a tyre with a puncture. The eye has a pump that produces a small amount of fluid. If this fluid drains properly, the eye pressure (also called intraocular pressure) will be low, but if it isn't draining easily, the eye pressure will rise. If the pressure gets too high, the optic nerve can be permanently damaged. It's possible for your optic nerve to be damaged even if your eye pressure is normal. There are many different types of glaucoma, which can cause different symptoms and need different treatments. Most people have open-angle glaucoma. 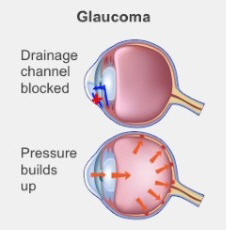 In this type of glaucoma, fluid can't flow out of the eye properly, and the pressure gets too high. People with open-angle glaucoma have no symptoms until it's advanced, then it causes vision loss. The first signs you may notice are usually blind spots at the sides of your vision (peripheral vision loss) and in some cases reduced central vision. Glaucoma can lead to total blindness if you don't treat it. Some people get acute angle-closure glaucoma, but this is less common. In this type of glaucoma, the channels draining fluid from your eye become completely and suddenly blocked. This causes severe eye and brow pain, blurry or lost vision, redness in your eye, coloured haloes or rainbows around lights, and nausea or vomiting. Acute angle-closure glaucoma is a medical emergency and must be treated immediately. This page has details of where to go for after-hours medical help. Other types of glaucoma include low-tension, angle-recession, steroid-induced, pigmentary and neovascular glaucoma. Occasionally, babies are born with glaucoma. Glaucoma is diagnosed by testing your vision, including peripheral vision (visual field tests), looking through your pupil directly at the optic nerve, and by measuring your eye's pressure (intra-ocular pressure). A good first step is to see an optometrist for these tests. You can also see a GP, but they may advise you to see an optometrist who can do more detailed tests. If your optometrist or GP thinks you may have glaucoma, they'll refer you to an ophthalmologist (eye doctor) who can confirm the diagnosis and start treatment.